Dental fillings are a type of dental treatment used to repair minimal tooth fractures, tooth decay, or otherwise damaged surfaces of teeth. 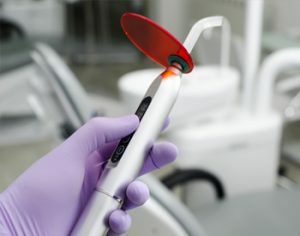 Dental filling materials, which include composite, porcelain, and silver amalgam, may be used to even out tooth surfaces for better biting or chewing. Tooth decay results in loss of enamel from the tooth surface. The most common indicator of tooth decay is sensitivity or pain while eating hard food or drinking cold water. If left untreated, tooth decay could rapidly spread through the tooth causing excruciating pain. Tooth-colored composite: This benign resin material restores your teeth and is the same color as teeth, making it close to impossible to detect. It is a completely safe and strong material that will stand up to daily grinding forces. Silver amalgam: This a strong restorative tooth filling material that has been used for many years as a filling material. However, it does possess certain disadvantages over the tooth-colored filling – it is black in color, which is easily noticed. It also contains minor quantities of mercury which is considered to be hazardous if ingested.